Fishing structure is "critical" to catching largemouth bass and only slightly less critical to catching smallmouth bass. So to fish structure you must be able to find it! Structure, in it's simplest form, is some change in the lake bottom, be it shallow or deep. Though many anglers consider "structure" and "cover" to be one in the same this is not accurate. Change in bottom profile constitutes "structure" and this can be a change of a foot or twenty feet. In a "reservoir" this change in profile, i.e. "structure", could be a hump, point, sunken island, creek channel, submerged road bed, rock pile, breakline or a sloping shoreline. In a "natural lake" the change may be a very gradual slope that is no more than a couple of feet to five feet change in depth that slopes out over a 50 yard distance. It might be a drop of a foot, the difference between the bottom and edge of a small channel running through a broad flat that is only 5 or 6 feet deep. On the other hand, "cover" includes natural and man made items such as vegetation, like underwater or emergent weedbeds, brush piles, submerged wood, stumps, laydowns, building foundations, bridge pilings, boat docks or even old cars. The best structure for bass will be that which also has cover on it like weeds, stumps, laydowns, rip-rap or brush. Fishing structure is important because bass are primarily structure oriented creatures. 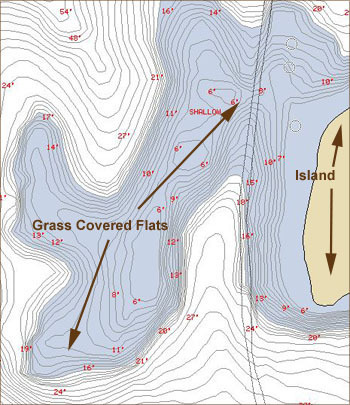 Bass, both largemouth and smallmouth, use structure as reference points in traveling throughout their territory. Studies have established that bass are to a great extent "home bodies" staying within a specific area of a lake or river most of their lives. They travel within these areas with the seasons. The size of these home ranges vary with individual bass and the size and nature of the body of water. 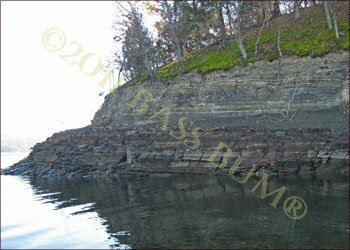 Structure, at least good structure, also provides bass with quick access to deep water since most structure is associated with a change in water depth. It's very similar to the way we live our lives. We all have a specific route we use in getting to work each day and along that route are buildings, signs, etc that we use, even if unconsciously, to guide us to our place of work. We do the same when going to our favorite neighborhood restaurant. Bass do the same. They use structure as their guide to specific areas of their territory where they work, which is where they eat and pursue amour. It's sorta like how we continually return to our favorite sports bar. They also use structure in another way when feeding on baitfish. A common strategy is for bass to "herd" baitfish against some barrier (structure, edge) which limits their escape and makes them easier to feed upon. Bass will always choose structure as their hangout and it is well established that in any given lake only 20% of the water you see holds fish of any kind and the biggest part of that 20% will be around structure of some sort. So you better focus on "fishing structure" if you want to increase your odds of catching bass. How do you find structure? When fishing structure you can get a pretty good idea about its location and type by monitoring the shore structure. What is above the water at the shore's edge can pretty well be depended upon as an indicator of what is under the water as the terrain extends into the lake or reservoir. If you have a 45° slope going into the water chances are that it continues under the water at that point as well. If there is a sharp bluff wall chances are the wall continues under the water and if you find a point above water it will most likely continue into the water. Using the shore terrain as an indicator is good for locating points and bluffs when fishing structure, but what about "offshore structure" like rock piles, offshore humps and submerged islands, drop offs, old roadbeds and river or creek channels? Shoreline structure is not usually a reliable indicator of for offshore structure. 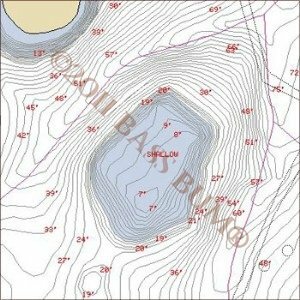 The quickest and easiest way to find these structures is with a current lake map and a good sonar unit with GPS capabilities. When fishing structure I'll crisscross an area I've located on a map while closely watching my depth finder and tossing out markers to pinpoint structure features. For example, I mark the tip of a point as well as each of its (edges) sides, that is, where they begin their slope away from the top of the point. I'll begin at the shore and travel out toward the end of the point to mark its tip than crisscross to mark its sides. If I've identified the location of a hump I will do the same by crisscrossing it and marking its top and placing markers around its periphery where the depth drops away from the top of the hump. In your efforts fishing structure this process allows you to effectively work an area of structure completely and accurately and in the least amount off time. Additionally, you may uncover structure features that may not be found on hydrographic maps. For example, you may notice a rise or fall off the main point that indicates a smaller secondary point. These can be very productive when fishing structure like points. You might uncover the results of man's activities such as pits or rock piles that don't appear on older topographic maps. The primary attraction of of any structure is an edge of some sort, be it ledge (steep) or slope (gradual), that defines a change in water depth. All the following structures have edges and represent the majority of structure types. If you wish to increase your catch success rate you better spend your time fishing structure and to do that you must know what structure types there are. Take a point for example. This is a piece of land that extends out from shore into a body of water at a gradual or rapid rate of fall. Off each side there will be found either ledges or sloping sides into deeper water. It's tip may abruptly end with a drop off (ledge) or continue its gradual slope till it merges into the bottom in general. When fishing structure points are where you should start. These are points which run off the side of a main point either perpendicular to or at an acute angle to the main point. The angles created where a secondary point intersects with a main point can be the gathering place for bass that call that point home. These are usually best spots to fish of the entire point area. A hump is a piece of lake bottom that is elevated toward the surface but remaining below it. Humps are surrounded with a ledge or slope that descends into deeper water. Note in the image right that the hump has a slope that descends fairly rapidly into deep water. It is a submerged small island if you will. A submerged island is a "large" hump but by its size offers many different fishing opportunities. You can find features like bluffs, points and cuts around a structure the size of a submerged island. Not so much so with a "hump". This is a steep, usually broad wall rising out of the water which also extends downward into the water's depths. 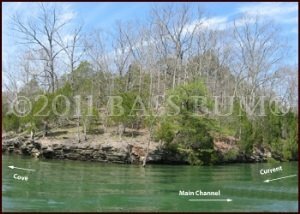 Bluffs are riddled with overhangs and cuts where bass hide out. A cut is an opening penetrating a bluff wall where there is deep water in the center of the cut but shallower water on its two, maybe three sides. Deeper water is usually found beyond the mouth of the cut. A cut might be viewed as a mini-cove. A saddle is comprised of two humps or two points fairly close to one another with a low area between them. The opposite of a hump. Simply an area of deep water surrounded by shallower water. A flat is typically a rather shallow area which slopes gradually away from shore to what is called a "breakline" where there is often a quick increase in water depth. This is where the slope meets a main lake or creek channel. In fact, there is usually a series of breaklines between the shore and this final breakline. Those in between are depth changes as well but are usually quite subtle, a foot or two. Sometimes flats are sparse with cover while other times clogged with it, such as grass. Fishing structure, any structure, that also has some type cover on it is a high percentage technique. Flats are, depending on the season, good places to fish. Especially if they have cover such as grass or stumps. Structure provides bass a route to travel from deep to shallow water where they find their food and spawn. Baitfish, crawfish and insects are found in shallow water or what is their version of our sports bar. Studies have shown they will move shallow to feed at least once if not twice a day. They will move shallow but how long they stay and just how shallow they go is determined by weather and water conditions. They might move up to 3-5´ one day and only 10´ the next due to weather and water conditions. Bass spend most of their lives around deep water structure instead of shallow. By that, I mean at 20´ or more and is where we have very good chances to catch them. Remember, "good structure" is defined by the availability of "deep water" near by and deep is relative to the body of water you are on. Increased success will come to those of us who move to deeper water when fishing structure. The lures we use are in some cases the same, in some cases different, than those we use shallow. But one absolute is the necessity to fish them accurately. Since bass holding deep are usually less aggressive than those shallow, you must put your lures in their face because they aren't as likely to chase them as they might in shallow water. The techniques and lure selection for fishing structure vary with the type structure. On other pages we'll look at some of the different structure types and how best to fish them.